Doctors often treat hypothyroidism with levothyroxine (T4). New research is revealing that many people also need T3 to feel good. One of the most controversial and contentious issues in endocrinology has to do with the best treatment for hypothyroidism. Most doctors insist that standard treatment with levothyroxine (L-T4, Levothroid, Levoxyl, Synthroid, Tirosint, Unithroid) is the answer to a sluggish or inactive thyroid gland. They reject natural thyroid or supplementation with T3 (Cytomel or compounded slow-release products) as unnecessary or unreliable. 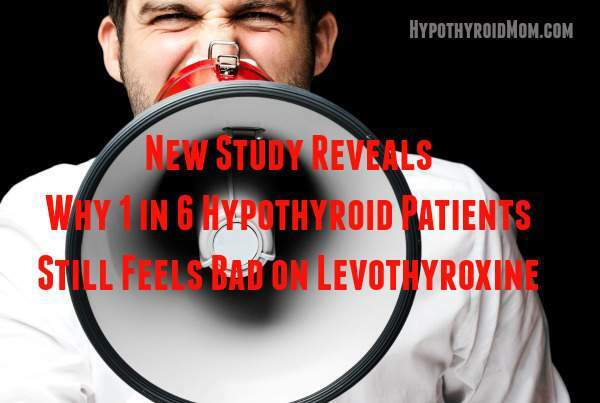 Many people with hypothyroidism (estimates range from 12 to 15% of patients or higher) complain of symptoms when they are treated with standard levothyroxine. Even when blood tests (TSH) suggest that thyroid function is normalized, these individuals feel like crap. They complain of fatigue, impaired cognition or “foggy brain,” weight gain, and general malaise. Until now, many endocrinologists were inclined to chalk up such complaints as psychosomatic, ie, all in the head. They did not wish to contemplate a problem with the standard treatment regimen. I have been on Synthroid for 40 years. I definitely have problems that have grown over the years. I go for my TSH blood test and it comes back within the normal range. So the doctor prescribes my usual .125 mg Synthroid and sends me on my way. When I had two separate incidents of depression and anxiety, I was prescribed the antidepressant Paxil. After one year my legs swelled up even more than usual. I suffer from constipation, lack of energy and lower back pain and have not been able to lose weight for years. My muscles ache all the time and my feet hurt constantly when I walk very far. I‘ll be 66 years old in a few weeks and I feel like I am 80. I read all the articles and am very aware of the foods I should and should not eat. All my doctor cares about is the TSH test, and as long as the result comes back within the normal range he is happy and assumes all is well with my thyroid. How Do We Get from T4 to T3? To understand the complexity of thyroid supplementation, we need to take a quick detour into some basic biology. Don’t panic! We will do our best to make this understandable. The thyroid gland makes a few hormones but we are only going to focus on two, T4 (thyroxine) and T3 (triiodothyronine). The numbers T4 and T3 represent the number of iodine atoms ( 4 and 3 respectively) attached to the basic hormone structure. Thyroxine (T4) is a prohormone and is relatively inactive. It has to be converted to T3 by the body. An enzyme removes one of the iodine atoms to accomplish this. As much as 80% of T4 is converted to T3. T3 is three to five times more potent than T4. So the efficient conversion of T4 to T3 is critical, and levels of circulating “free” T3 are essential to well being. Okay, before your eyes glaze over, let’s get to the new and exciting research. A team of investigators led by endocrinologists at Rush University Medical Center (in Chicago, IL) has just published studies in the Journal of Clinical Investigation (online, Jan 2, 2015) and the Journal of Clinical Endocrinology & Metabolism (online, Jan. 8, 2015). Their animal research involved removing rat thyroid glands. When the scientists tried to normalize hormone levels with just levothyroxine (L-T4) they were unsuccessful. The animals demonstrated signs of hypothyroidism, especially within the brain, which might account for why some humans complain of cognitive dysfunction on T4 alone. The investigators were able to normalize circulating T3 levels and improve symptoms by supplementing T4 with extra T3. Their human study uncovered genetic variability in patients suffering from hypothyroidism. They estimate that the mutation exists in 12% to 36% of the population. It makes it harder to convert T4 to T3. The scientists detected negative brain changes in patients that have difficulty making the T4 to T3 conversion. Such patients generally prefer a treatment regimen that involves both levothyroxine together with T3 supplementation (Journal of Clinical Endocrinology and Metabolism (May, 2009). My daughter has had hypothyroidism since she was 12. She is now 28 and took Synthroid up until 2 years ago. She felt lousy and was tired and her hair fell out and she had dry skin, even though they said her levels were fine! Well she started to take Armour Thyroid two years ago and there was a huge difference! She feels better and was also able to lose 60 lbs over the past 2 years. She couldn’t lose any before, as hard as she worked at it. I highly recommend Armour instead of the Synthroid! I have struggled with thyroid problems since I was 8. At age 57, I’ve had thyroid cancer twice, 2 surgeries & now high dose radiation/ablation. My last surgery was 18 months ago & I have gained 18 pounds since then. I have no energy & struggle to stay awake. My hair & nails are falling off. I’ve been getting weekly iron IV infusions yet my red blood cell & ferritin levels as well as thyroid levels remain low. For years I took Armour Thyroid & was happy & healthy. Now I’m told I MUST take Synthroid even though I feel it’s ruining my life. I’m in my doctor’s waiting room now; I plan to show him these articles & ask for Armour. It’s hard to imagine the damage levothyroxine has done to my life unless you have lived it. I urge all people taking Synthroid but feeling poorly to tell their doctor & give Armour a try. I have taken Armour Thyroid, Synthroid and Levothroid at various times. The ONLY one of the 3 that did not give me major side effects has been the Armour Thyroid. I have much more energy, no headaches and no fatigue like I have with the synthetic products. We are not beating the drum for Armour Thyroid or any particular brand of natural or synthetic thyroid hormone. Some doctors prescribe levothyroxine and supplement it with Cytomel (T3) or with a special timed-release T3 formulation that compounding pharmacists can make. This creates more balanced T4 and T3 levels circulating within the body. Thyroid hormones are essential for normal body functioning. Getting the balance adjusted is a little like Goldilocks and the porridge; not too hot, not too cold, not too much and not too little. We want you to get it just right. For more than four decades, Joe and Terry Graedon have been teaching, writing, and broadcasting information to help people make informed decisions about their health. The People’s Pharmacy website provides insights about the pros and cons of prescription and over-the-counter medicines. Visitors share stories about side effects, interactions, and generic drug complications that often haven’t yet reached the FDA. The People’s Pharmacy community of readers also reports valuable experiences about affordable alternative treatments that might help solve a problem without a prescription. Joe Graedon has been on the Dr. Oz Medical Advisory Board since 2012. I have been on levothyroxine for more than 10yrs. I have been for the last five yrs having headaches and feeling fatigue and always in a brain fog and my hair has been thinning and been trying for yrs to lose weight . I have been telling the doctors my symptoms and they do blood work and it comes back normal levels. I am almost 50yrs old and tired of telling doctors that don’t listen or don’t know much about thyriodism. What can I do to get the doctor to change my thyroid medicine. I am tired of feeling lousy. I was diagnosed with hypothyroidism about a year and a half ago and put on levothyroxine. My levels are in the normal range now, but I still feel “lousy.” I have lung insufficiency, but sometimes feel fine, and sometimes feel awful. As a child, I had undiagnosed sciatica, and my spine is a tangled mess. Doctor’s blame my breathing problems on the compression caused by spinal issues. I have been told that surgery is not a viable option because of age bone problems, etc. I have also been diagnosed with slight COPD, cataplexy and narcolepsy, osteoarthritis, kyphosis, along with various and sundry other ailments. I have tried to convince my doctor to adjust my levothyroxine dosage, but he thinks my levels are right in the middle, and therefore just right. I am wondering if my thyroid condition could be more of an issue than my back as far as my breathing is concerned. I am 72, and a retired school teacher. This is soooo NOT new to the 1000’s of people taking Armour for decades. Doctors have been PROGRAMMED to prescribe synthetics to their patients. What do they think was available at the turn if the 20th century? Pig thyroid. Armour. My aunt’s thyroid stopped working in 1936. It runs in my family. She was put on Armour. I’ve been on it for 32 years. I take 150 mg. If you still don’t feel good, then start taking ionic (liquid) magnesium & vitamin D3 & see if that helps. Some people need more, 180 mg., 3 grains. Make sure your doctor is not just taking a TSH test, but also FT3 & a FT4 tests. The on their range, it should be toward the higher side to be optimal. Do not settle for acdoctor who will not subscribe Armour or another like Nature throid or WP Thyroid.